Every Hugo Award winner in 64 weeks! 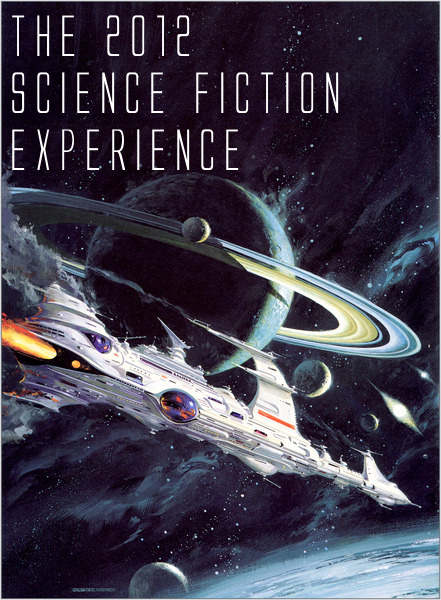 The 2012 Sci-Fi Experience ends tomorrow! For those of you who missed my original post, the challenge started in January and I have been participating since beginning this blog (here's the review site). It has been great fun, a really well hosted challenge and I now have quite a lot of books I want to read. I entered the scene a little late, but was able to contribute 5 reviews. Anyone looking for their next book should go check out some of the 170+ reviews. thank you for the mention! I'm glad you enjoyed the "review" of Old Man's War. Linking to reviews from the Experience that you enjoyed is a nice idea, one I will be stealing for all future participation in challenges and non-challenges alike. I've been feeling so disconnected this year (unable to get myself organized well enough with school), but I was glad to pop over earlier to read your thoughts on The Demolished Man. I found Bester via The Star's My Destination (my favorite still) and enjoyed The Demolished Man immensely. Bester gets those little rhymes stuck in the head, like a marketing gimmick... Anyway, no doubt I will be perusing more of your posts, I am relatively new to reading sci-fi so I like having sources of recommendations and thought-provocation. Steal away, I'm glad you liked the idea. I think I'll continue to do it in the future as well. I found your blog through the Sci-Fi experience and I enjoyed a couple of your reviews. What I liked best about the post I linked to was the discussion of how great John Perry is. He was a really great character and he was one of those few characters that I wished I could meet in real life. I think I need to steal this idea too! I found a ton of great reviews and new blogs to follow through Carl's SciFi Experience. There were a bunch of Scalzi reviews which I appreciated, as I've three Scalzi novels on my shelf that I've yet to read. also, thanks much for the link! Wanting Seed is one of the freakiest books I've ever read. Cool, I hope the posting challenge favorites catches on. I've only read Clockwork so your review renewed my interest in his books. Is this one of your Scalzi novels to read? Maybe it should be. (Sorry not sure how to make that work better. Wonderful to have you taking part. I love the idea of posting favorite reviews. I'm going to have to keep that in mind for the Once Upon a Time challenge coming up starting next week. Never a big deal to join in late, I'm just happy you did so. I hope the rest of your reading year is filled with great discoveries! I'm glad so many people are digging that. This is the first time I've done these types of things and it has been so fun to cruise around to everyone else's blogs and reviews and hear what they have to say so it seems only natural to give a few shout outs to the best of the best of the best. I'll have to keep my eye out for OUT :) Always looking for a reason to force myself to read more than is humanly possible. Welcome to the club! We all need time machines just so we can keep reversing time so that we can read more. Thanks. At least listening to audiobooks during my commute has given me a little more time for extra "reading".